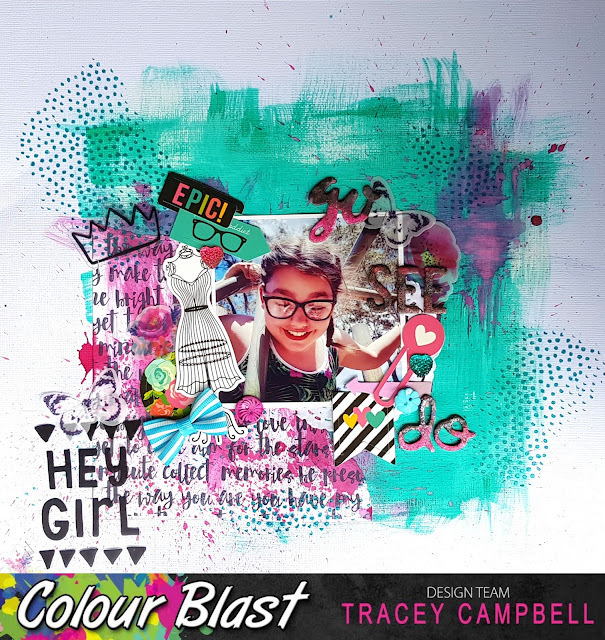 Hello and welcome Colour Blasters, it is my turn again on the blog today and I want to share a layout where I created a fun, funky and messy background with some of the Colour Blast products. First up I prepared a sheet of cardstock by painting square in the middle of it with White Heavy Gesso and a very large paint brush. 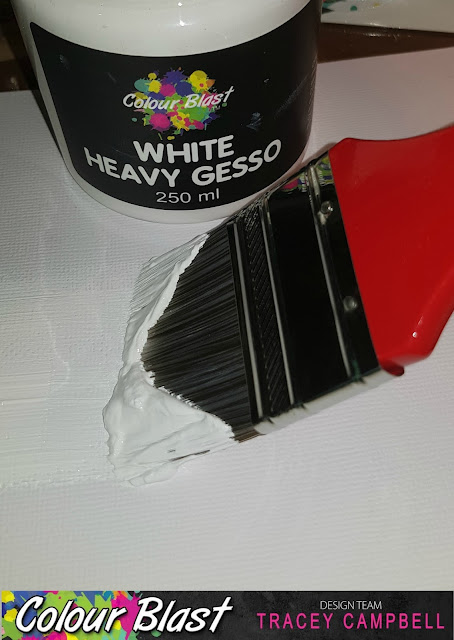 I apologise for the photo, but I wanted to try and show you how I just painted the Heavy White Gesso in he centre of the cardstock. Using a thick 1 inch paint brush I dry washed some Mermaid Colour Artist Ink. Dry washing is simply dipping a dry paint brushes edges into a small amount of ink or paint and applying it lightly to your paper. 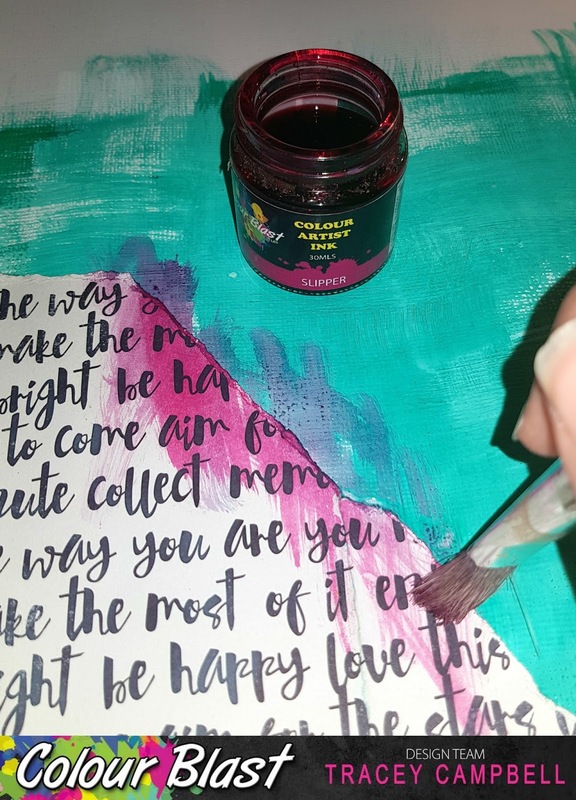 Keep using your lightly inked/painted brush until the ink/paint wears off onto the paper. 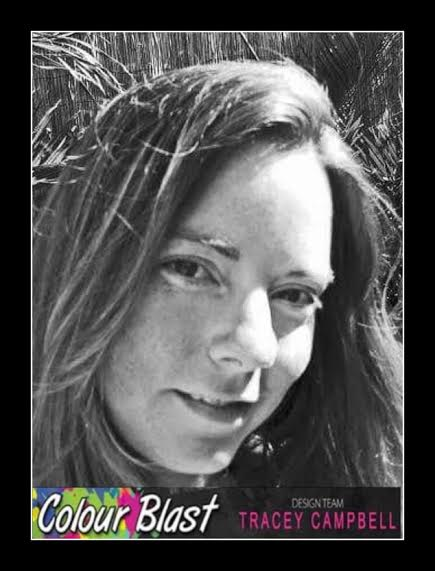 It gives you a streaky look to your media. As you can see I applied the Colour Artist Ink in a cross hatched messy way, over the top of the square of Heavy White Gesso. I adhered a small corner of patterned paper to the bottom left hand corner of the Colour Artist Ink / Heavy White Gesso square. I then used Slipper Colour Artist Ink to apply some messy streaks over the edge of the patterned paper and some random cross hatching on the Mermaid square with a paint brush. 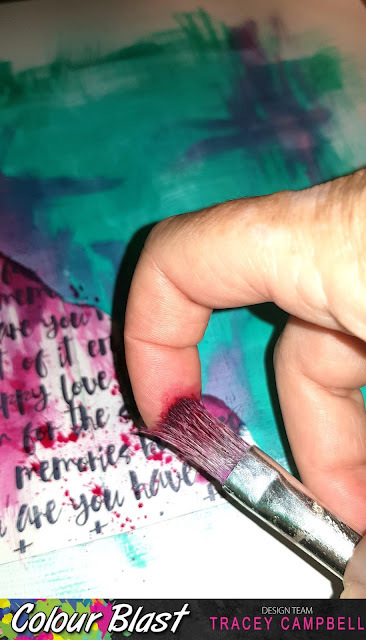 Then using the bristles of the paint brush I flicked splatters of Slipper Artist Ink over the page. Here you can see all of the back ground to give you an idea of what it looks like. 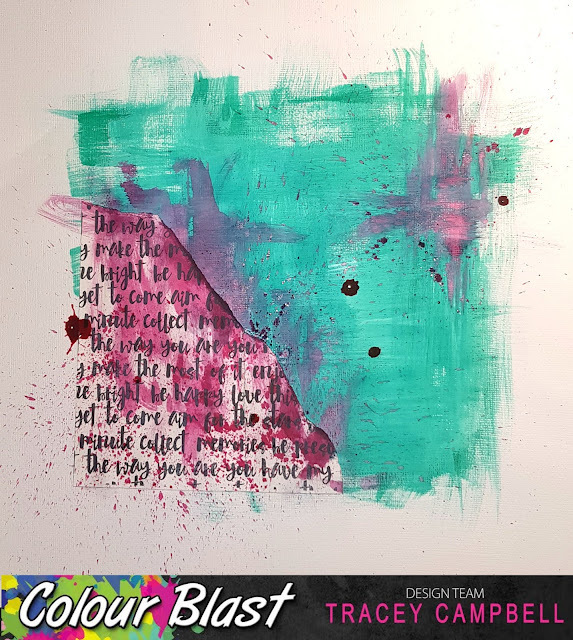 Once the Artist Ink was dry I applied some Deep Water Colour Paste through a stencil to add some texture to the page. Here you can see the positioning of the stencilled Colour Paste. Next I add the photo and the embellishments. 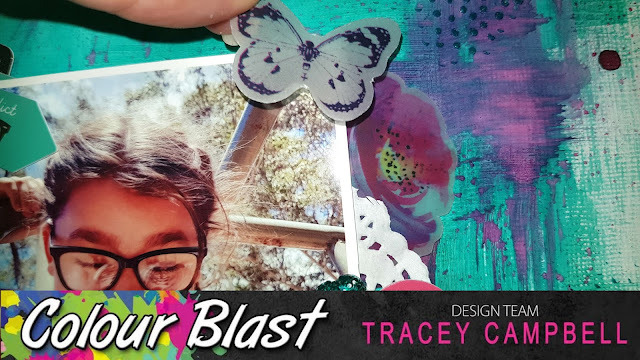 I wanted to show the funky Colour Blasted background so I grouped my photo and the embellishments in the bottom left hand corner over the top of the pattern paper. For the title I used a small amount of Colour Shimmer Dust in Duke and Lollipop. 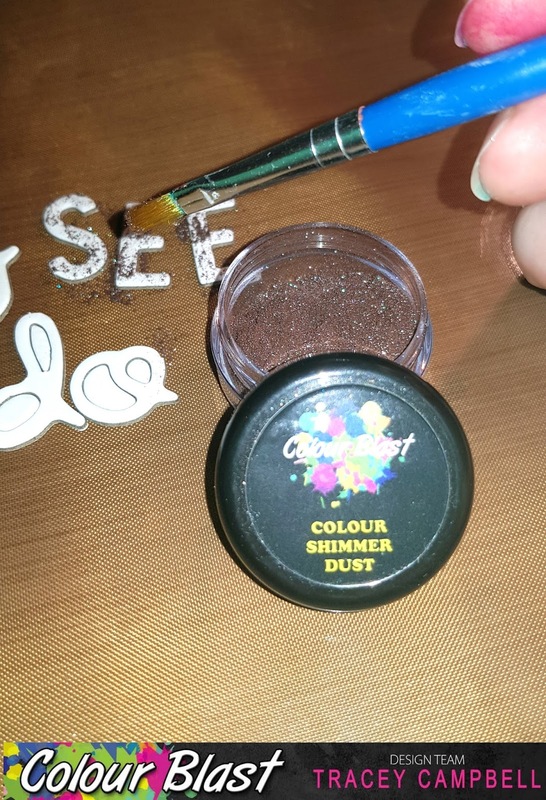 Using a dry paint brush I picked up the smallest amount of the Shimmer Dust and lightly tapped it over the top of some white chipboard letters. 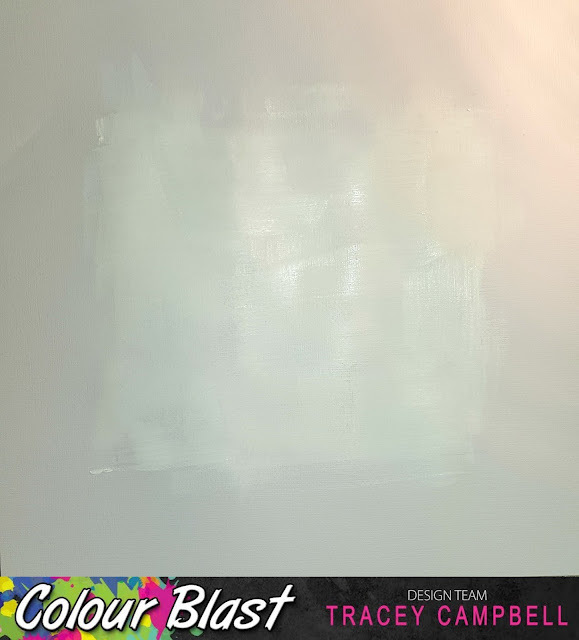 Once the Colour Shimmer Dust was on the chipboard I simply gave it a light spray with some water to activate. Here is the finished layout - a funky page which allowed me to get messy and have fun. It is bright and full of elements that remind me of my daughter. 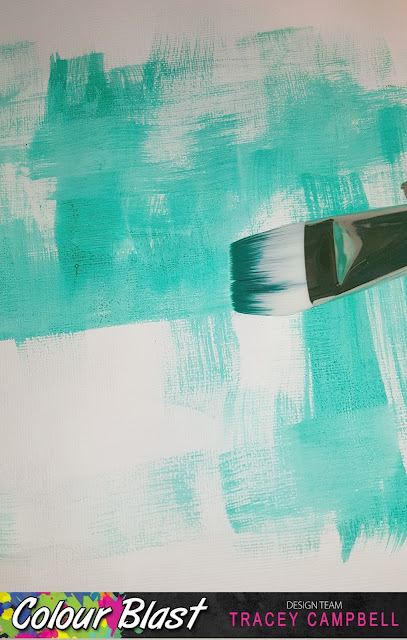 Thanks for dropping by, don't forget that we have daily inspiration on the blog with the Design Team sharing their creativity with you ever single day! 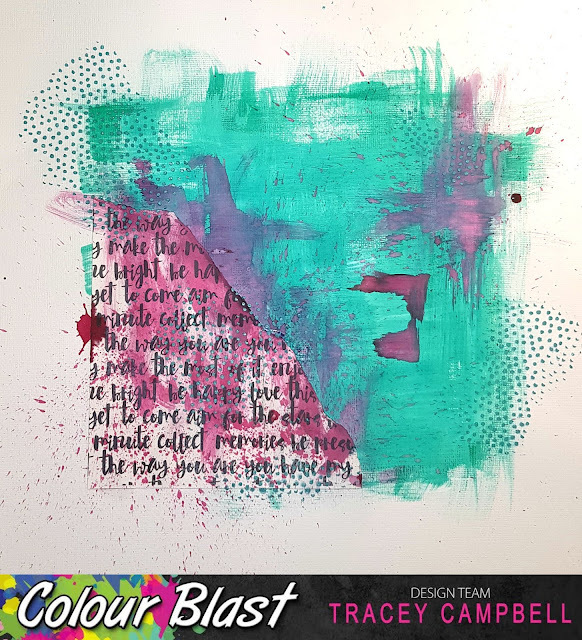 Before I go I do want to point you all in the direction of some of the wonderful blog posts that Tenisha has done recently, where she highlights the Colour Blast Products and gives you an outline, product guide, handy storing hints and some creative ideas. Here is the first link to Day One of Tenisha's posts, you can follow all eight days and eight products.